How can I purchase the KlevaKlip Adjustable Joist Support? Can I use the (AJH45G Aus/NZ) Adjustable joist support with joists of greater than 90mm height? Yes, the governing factor is 45mm in thickness, however there is no reason why the joists cannot be much greater than 90mm in height (eg, *120mm, *140mm ). Can I use the (AJH45G Aus/NZ) Adjustable joist support with hardwood joists? Yes, provided they are only 45mm thick. However, please note that you will most likely need to screw into the joists rather than using connector nails (and maybe even need to pre-drill). Can I use the Adjustable joist support with steel joists? We have not yet found a steel joist of the right thickness, so haven't tested this as yet. There doesn't appear any reason why it shouldn't work. Can I use the joist support cradle without the base-plate and just fix this to my concrete? Yes, the joist support component is designed to be able to be used on its own in areas that warrant this. The ribs in the bottom of the joist support will still keep the joist off the concrete by approx 6mm /15/64 inch. You do of course lose the "adjustable" aspect of the product. Can I purchase the joist support cradle separate from the base plates? No, the products come as a pair in boxes and cannot be purchased separate from each other. Do all the nuts, bolts, washers etc come included with the Adjustable joist supports? 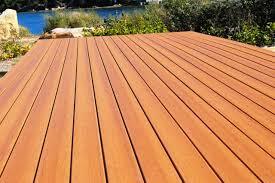 No, you must purchase these items separately as the height of the deck off the concrete will govern what length bolt will need to be used. AJH45G - Each Adjustable Joist Support ( joist holder + base plate) requires 2 x M10 Hex Head Bolts, 4 x M10 Nuts & 2 X M10 washers, 1 x 12mm x 50mm Galvanised 12mm dynabolt or x 10mm x 50mm masonry bolt or similar. What are the minimum and maximum length Hex Head bolts can I use? Minimum 60mm Maximum 120mm galvanised Hex Head bolts. The product comes in boxes containing 24 joist supports and 24 base plates.click here to see photo Bolts, nuts, washers etc. are purchased separately from your hardware store/merchant depending on what height you want to achieve. Do I have to use the two washers for every adjustable joist support? Yes, the washers are very important and form an integral part of the system. 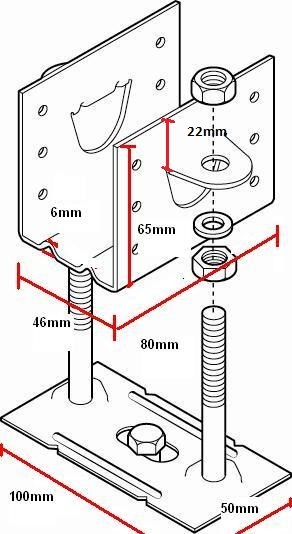 What size galvanised dynabolt /masonry bolt or screw anchor should be used to hold down the base-plate? AJH45G -1 x 12mm x 50mm Galvanised 12mm dynabolt or x 10mm x 50mm masonry bolt or similar. Note - if only using a 10mm dynabolt, you will need to use a washer under the nut to ensure you cover enough area of the base-plate. 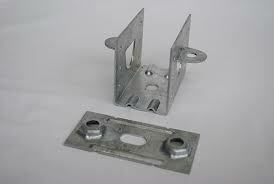 What galvanising standards is the Adjustable joist support galvanised to ? 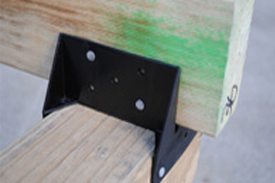 What is the Load bearing capacity of the Klevaklip Adjustable Joist Support? This has been independently tested to support a load bearing capacity of 350kg per square metre when used at the recommended joist spans listed below. Can I install the Adjustable joist supports over brick pavers? No, this is not recommended as the pavers do not have adequate structural stability. How to calculate how many Adjustable Joist Supports are needed for your deck? 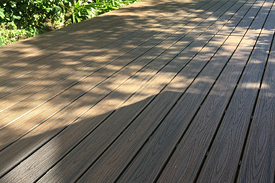 We quite often find that people have miscalculated the number of adjustable joist supports required for their decking area. We believe the main cause of this is that people work out the length of their joists, and simply divide by the "support spacings" (taken from our span table) they have decided on between the supports - eg - having a 3 metre length joist with spacings of 1 metre to give 3 supports. Wrong! - This does not take into account the initial support at the start of the joist. Therefore, the correct answer would be 4. Similarly, when working out the number of joists required, you need to work out the number of "joists spacings" along your deck and remember to add one for the initial joist. 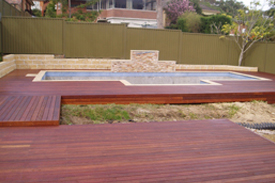 So, to finalise the number of supports you will need for your deck, multiply the number of joists on your deck by the number of supports to be placed along your joists. This should give you an accurate answer. IF IN DOUBT - DRAW A SMALL DIAGRAM WITH CROSSES FOR YOUR SUPPORTS AND SIMPLY COUNT THEM UP. How regular along my joists do I need to put the AJH45G (Aus/NZ) Adjustable joist supports? What length bolts do you require for AJH45G (Aus/NZ)? Note: All measurements based on using Galvanised Zenith brand long-hex head threaded bolts. What are the dimensions of the AJH45G(Aus/NZ) KlevaKlip Adjustable Joist Support Base Plate & Support?